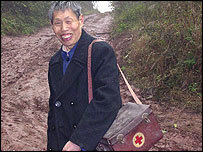 Dr Liu Quan trudges 20km (12 miles) a day along Sichuan's muddy mountain paths on his rounds. A village doctor for the past 55 years, he was just 15 when he started practising as a third-generation herbalist. In the 1970s he received simple training under Chairman Mao's programme to send "barefoot doctors" to serve China's rural masses. Dr Liu still wears a faded Mao suit and a picture of the Great Helmsman dominates his bare clinic. He remembers those days with nostalgia. "In Chairman Mao's time, you could see a doctor whether you had money or not. We could carry out disease prevention, like injections, whether our patients had money or not. Nowadays only those with money can get injections," he says. Today the old system providing near-universal access to basic healthcare has been dismantled, as the government tries to spread the cost of providing healthcare to more than one billion people. Economics rule and village doctors need to turn a profit. But making money is not easy when your patients are too poor to afford medical services. A World Health Organization survey measuring the equality of medical treatment placed China 187th out of 191 countries. The WHO's Hana Brixi explains: "Healthcare providers need to raise revenues. They are not covered even for the delivery of public services. "So they necessarily concentrate on those who have resources to spend. They provide excessive services to those who can pay, and limited services or no services at all to those who are unable to pay." The evidence suggests the poor are failing to seek medical treatment because of the cost, while the rich are paying more and more. Government figures show hospital visits actually dropped almost 5% between 2000 and 2003, yet hospital profits increased 70% over the same period. Behind such bald statistics lie heartbreaking stories, like that of Mrs Li. She lies semi-paralysed, unable to speak, in a well-known Beijing hospital. This is the result of a failed operation after she suffered a brain aneurysm. Her family have paid $18,000 and they do not know where the money has gone. Her daughter, Xie Pei, suspects the hospital increased the fees after finding out how wealthy they were. "My friend was visiting and a doctor asked her what my financial circumstances were like and what model of car I drove. The next day the doctor said the cost of the operation had gone up by $5,000." The family admits they gave bribes to the doctors. It is not supposed to happen but it is commonplace in China. "I gave $1,000 to the professor," said Xie Pei. "Before the operation, a doctor told me that surgery would take place that night and I had to give money to others, including the anaesthetist. In the end I gave $1,700 in red packets. The first thing they did after the operation [failed] was return most of the money." The hospital declined to be interviewed by the BBC while it carries out an inquiry. This case highlights many of the worst problems with China's health service. Since 1980, government spending dropped from 36% of all healthcare expenditure to 17%, while patients' out-of-pocket spending rocketed up from 20% to 59%. With low subsidies, hospitals need to find other ways to cover their costs. Hu Weimin knows their strategies all too well. He is a cardiovascular doctor turned whistleblower, who publicised his hospital's regulations showing how it made money from patients. At his hospital, in Hunan province, doctors and their departments got a percentage payment from every prescription they wrote. So the more medicine doctors prescribed, the more they earned. Each time a patient was hospitalised, the physician was awarded a bonus of $3, while more sophisticated procedures earned bigger handouts. 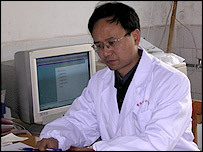 "There are many examples of chasing profit, such as ordering unnecessary test for a patient," Dr Hu told the BBC. "For example, if someone has a cold, giving them a CT scan. One media report said a girl had 108 tests for an appendectomy, including an Aids test. Moreover the cost of medicine has doubled, tripled or worse by the time it reaches the patients." Dr Hu was unwilling to speak about his own experience in detail. He had been beaten after exposing his hospital's charging system, and his family have moved elsewhere, fearful for their safety. But Dr Hu admitted hospitals have no choice but to act the way they do. "Our hospital's state funding isn't enough to even cover staff salaries for one month. Under the current system, hospitals have to chase profit to survive." The system has even been criticised by a government think tank, the State Council's Development Research Centre, which said healthcare reforms had "basically failed". It warned that social stability and public support for the government could be affected if the country does not overhaul healthcare. But health ministry spokesman Mao Qun'an disagreed. "We're providing basic health services for 22% of the world's population with 2% of the resources. I think we've had enormous success," he told the BBC. He also outlined an ambitious programme of further reforms, including building low-cost hospitals in cities and providing healthcare insurance to the whole population by 2010. However, Mr Mao acknowledged the system of hospital funding was flawed and admitted there was some overcharging. "I think we are bravely admitting that problems exist in our medical system, and that's a sign of our self-confidence," he said. "It's an expression of our determination to tackle these problems." 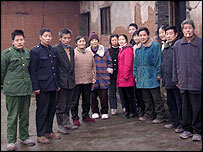 But in Fengyan village in Sichuan province, change will come too late for one family. Mrs Cheng is already stick-thin, her flesh cleaving to her bones. She watches as the rest of the family eats, unable to keep her food down. She has womb cancer, but had to stop treatment after four rounds of chemotherapy. "We have no money," she told me. "We relied on friends and relatives to raise money, but they can't raise any more. I still need treatment, but there's no more money." Her son dropped out of high school to find work, sacrificing his future to raise money for his mother's treatment. Her husband, Liu Niancai, admits her illness has plunged the extended family, and some of their neighbours, into poverty. "We used our life savings, more than $1,000, for treatment. But it cost more than three times that. All our relations and friends gave money, but it wasn't anywhere near enough," he said. One World Bank study found 20% of China's poor blamed healthcare costs for their financial straits. And the country's healthcare crisis reflects its biggest problems - fighting corruption, and bridging the ever-increasing divide between the rich and the poor, the city and the countryside. With anger growing among the have-nots, China's leaders may find the political cost of failing to solve the problem could be higher than they ever imagined.